Pauline Twachtmann Ahrendsen, 89, formerly of Anamosa and Monticello, died Sunday, December 10, 2017, at Summit Pointe Senior Living in Marion following a long battle with cancer. A Mass of Christian Burial will be held at 10:30 a.m., Saturday, January 6, at Sacred Heart Catholic Church in Monticello. Interment will be in Holy Cross Cemetery in Anamosa. Father Paul Baldwin will officiate at the services. Visitation will be held from 4 – 7 p.m. Friday, January 5, at Goettsch Funeral Home in Monticello, where a parish Vigil Service will be held at 4 p.m. Surviving is her husband of seventeen years, Gayle, and five children from her previous marriage of thirty-five years to Donald Twachtmann. Her children are Pamela (Ron) Pickup of Soulsbyville, California; Dona Swindle of Crawfordville, Florida; Teresa Medinger of LaJolla, California; Ted (Linda) Twachtmann of Anaheim Hills, California; Tamara (Nathan) Schwab of San Francisco, California; and a daughter-in-law, Deb Twachtmann of Cedar Rapids; three stepsons, Mark (Cathy) Ahrendsen, Monte (Margo) Ahrendsen, Bruce (Jolene) Ahrendsen; nine grandchildren; ten step-grandchildren; nine great-grandchildren; four step-great-grandchildren; two brothers, Paul (June) Benischek, her twin, and Stanley (Janet) Benischek; and two sisters, Rita Chapel and Marlene Werden. She was preceded in death by her parents; her husband, Don Twachtmann; a son, Todd Twachtmann; a sister, Elsie Shaw; and two brothers, Otto and Raymond. Pauline Ann Benischek was born March 29, 1928, in rural Oxford Junction. She was the daughter of Albert and Tillie (Tatak) Benischek. 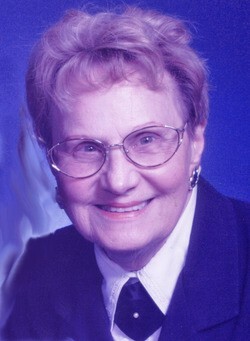 She attended rural schools in Clinton County and graduated from Oxford Junction High School in 1945. She worked at the Volks Grocery Store while in high school and, after graduation, she was a governess in Cedar Rapids for the summer. Pauline then went to work at Iowa Mutual Insurance in Cedar Rapids and later in DeWitt. Pauline married Don Twatchmann April 23, 1949, at Sacred Heart Catholic Church in Oxford Junction. The couple farmed in Cedar, Jackson, Linn and Jones counties. Don preceded her in death on April 20, 1985. In 1991, Pauline moved to Bella Vista, Arkansas, where she volunteered at the Adult Day Care, Helping Hands, and Walton Art Center. Pauline married Gayle Ahrendsen on March 31, 2000, in Bella Vista. For seven years, they spent the summers on the Ahrendsen farm near Olin and wintered in Arizona. In 2008, the couple purchased a home in Monticello and resided there until December 2016, when they moved to Summit Pointe Assisted Living in Marion. Pauline was a member of Sacred Heart Catholic Church in Monticello. She was a former member of St. Joseph’s Catholic Church in Stone City and St Patrick’s in Anamosa. She loved to play cards and enjoyed sewing, gardening and baking. She was an incredibly strong woman who always put others before herself. She will be missed by all that knew her.